Every day, it seems, there are more signs of the accelerating decline of the American Empire. The economy is tanking, the currency is being abandoned by other nations, health care remains a disastrous failure, unemployment is atrociously high, prisons are filled to capacity, public education is failing yet another generation of children, and the population seems to be getting more diseased with each generation. Why is our population so diseased? Why is unemployment so high? Why can't our kids learn well in school? Why is America losing its leadership position in the world? Why are so many jobs being offshored to other countries? Poor nutrition destroys any nation. Good nutrition saves it. 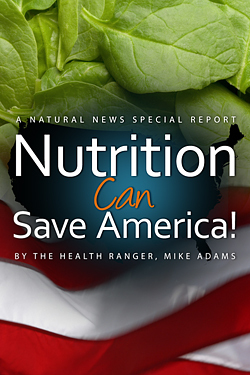 And in this NaturalNews special report, you'll learn why nutrition plays such a powerful role in the rise or fall of any nation. It's also a warning message for America: If we don't make immediate, radical changes in the available food supply -- and the marketing of foods to consumers -- we won't survive much longer as a nation. America will fall, brought down by the inevitable consequences of a nutritionally deficient, chronically diseased population. But to understand why this is the case, you first have to see why food has such a powerful impact on everything that matters in society: Health, happiness, employment, productivity, education and even freedom. To explain all that, let's start with a lesson on poor nutrition.